This convenient dispenser makes hygienic hand disinfection particularly easy. The IMPRESAN Hand Sanitiser Gel has a fresh scent and eliminates more than 99.9 per cent of specific bacteria, fungi, and viruses. Germs spread particularly quickly through the hands. Therefore, regular hand hygiene is essential. With the IMPRESAN Hand Sanitiser Gel dispenser, you can disinfect your hands in only 30 seconds and ensure healthy hygiene, even without water. The gel turns to liquid in your hands, rubs in easily, and is refreshing. The gel is suitable for sensitive skin and those with allergies. Skin compatibility is dermatologically confirmed. The IMPRESAN Hand Sanitiser Gel is bactericidal, yeasticidal, and even offers limited virucidal properties. For reliable hygiene, observe the application time of 30 seconds. The number of applications depends on the hand size. 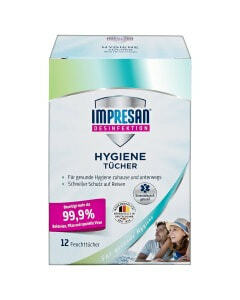 The IMPRESAN Hand Sanitiser Gel dispenser eliminates more than 99.9 per cent of specific bacteria, fungi, and viruses. You are left with reassuring hygiene. Put some gel onto dry hands, rub completely over hands, and allow to take effect for 30 seconds. ATTENTION: Flammable liquid and vapour. Causes serious eye irritation. If medical advice is needed, have product container or label at hand. Keep out of reach of children. Keep away from heat/sparks/open flames/hot surfaces. – No smoking. IF IN EYES: Rinse cautiously with water for several minutes. Remove contact lenses, if present and easy to do. Continue rinsing. Store in a well-ventilated place. Keep cool. Dispose of content/container in compliance with local and national regulations.